Whether your issue is personal, health-related, financial or social, there’s likely somewhere on campus suited specially to assist you in your time of need. Being on your own and away from your family can be nerve-wrecking, especially if you’re not feeling well or you’ve got an issue that needs resolving. Luckily, colleges have you covered with various school services so that, no matter what the situation, you are not alone! Whether your issue is personal, health-related, a financial struggle or social, there’s likely somewhere on campus suited specially to assist you in your time of need. Don’t believe us? Check out these examples of services offered at most colleges: Advising If you’re having any trouble with your schedule or any issues regarding academics, your advisor will likely be able to help you seek out a solution or, at the very least, point you in the direction of someone that can. Career Centers Career centers are a great place to turn if you’re unsure about your major or want to look into potential job available within your field of study. In addition, college career centers also host workshops and classes on job skills like writing résumés or job interview practice and preparation. When it comes time to look for a job, the career centers usually have resources to help you find employment in your field. Commuter Services Some colleges offer services for students who are not able to live on campus, the commuters. Instead of commuting back and forth between classes, schools often have student lounges for commuters. Also, they are able to assist in finding off-campus housing, aid in getting commuter privileges like parking passes and general support with any other issues commuters may encounter. Counseling If you feel your issue may be more serious, talking to a mental health professional at your school can certainly help. Many students have issues with stress or depression and utilize these services daily. The majority of schools offer a number of free counseling sessions per students, a service of which many students are not aware. If you feel you need more counseling, the professionals will be able to recommend someone to speak to or where you can seek treatment. Financial Aid Office Financial aid can be one of the most frustrating and difficult aspects of a college career for students. The financial aid office is there to help you sort out any issues you may encounter along with helpful staff financial aid officers who are able to explain your financial aid and loan eligibility. These officers have the sole job of helping you pay for school in the most cost-effective, efficient way possible and are experts within their field. Additionally, the officer can usually help with any questions regarding the Federal Work-Study Program, a program which offers students the opportunity to hold a part-time job as part of their financial aid agreement. Fitness Centers While many students believe the on-campus fitness centers are only reserved for the athletes, the opposite is usually true. Most colleges want to provide an atmosphere where it’s easy to maintain personal health and fitness for all students. Health Centers If you start to feel under the weather, the on-campus health centers are a great spot to utilize. There, the doctors and purses on staff are able to provide medical services, treat any illnesses or injuries and give immunization shots, often with much faster appointment times than your local medical health care professional. Libraries The library services are often looked over because they are ubiquitous on college campus but don’t let these valuable resources fade into the background! In addition to providing any research assistance you may need, campus libraries offer quiet places to study, multi-media rooms and is a safe spot to meet tutors. Religious Centers Depending on the college, counseling is available from various clergy members. The schools likely determine the different types of religions that are represented based on need. Residential Services Campus housing options, like dorms, usually have people on staff readily available to help you with anything you may need. Resident advisors, sometimes known as resident assistants or RAs are the most common form of aid. The roles are usually filled by older college students, juniors or seniors, who live in the dorm with you and are available to act as a counselor and guide you along the way in college life. Special Circumstances Colleges often offer services for students in unique situations. There are many different types such as: international students, students with disabilities, students with children and students who identify with the LGBTQ community. Study Abroad The office of study abroad is the liaison between taking your classes on your college campus or somewhere vastly different. They will have all of the information on study abroad programs, their qualifications and how to apply. The staff will be able to assist you throughout the study abroad application process, should you need it. Technology Support As a college student, you’ll find that now, more than ever, you’re relying on technology in the classroom and to connect with family and friends back home. 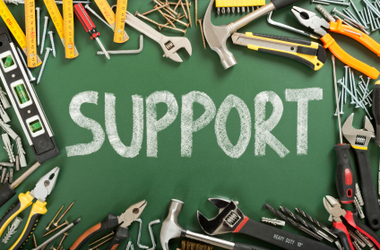 Should you encounter any issues in this area, IT support is available to help with any troubleshooting. Do you have other school services you’d add to the list?